Lakeside in Quebec in the tony ski town of Mont-Tremblant, in the heart of the Canadian Laurentians, you’ll uncover a fine-dining gem: Restaurant La Quintessence, the main dining establishment of Hôtel Quintessence. The French restaurant is in the bottom floor of the hotel, overlooking Lac Tremblant. The scene at Restaurant La Quintessence is sophisticated yet intimate. Warm fires burn in the hearth, soft lights glow from the wall chandeliers, and candles flicker at every table. 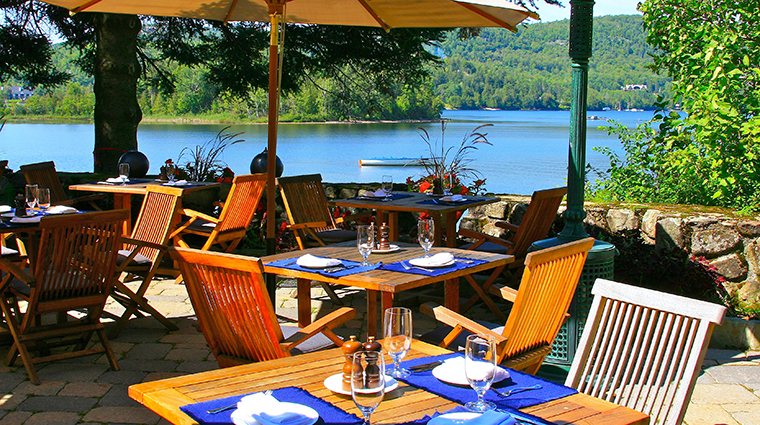 In summer, consider a table on the terrace, overlooking the clear blue water of Lac Tremblant and the Laurentian mountains beyond. The hotel’s position on a hill offers a photo-perfect view of the lake and its surrounding Laurentian mountains. During the winter, reserve a table by the window with a view of the snow or next to the fire in the Mont Tremblant restaurant’s adjacent cave-like Winebar. • The menu at the French restaurant is exceptional. • The hotel’s French Chateau theme is evident in every room, including the restaurant. Walls of stone, floors of dark polished wood, and jazz fusion music sifting from the speakers set the scene. • Curious about wine? Ask away — each waiter is a trained sommelier, ready and willing to educate you on the Mont Tremblant restaurant’s 4,000-bottle wine cellar. • Both the restaurant and its wine bar are small, intimate establishments with limited seating. To avoid disappointment, reserve a table at Restaurant La Quintessence when you book your room at Hôtel Quintessence. 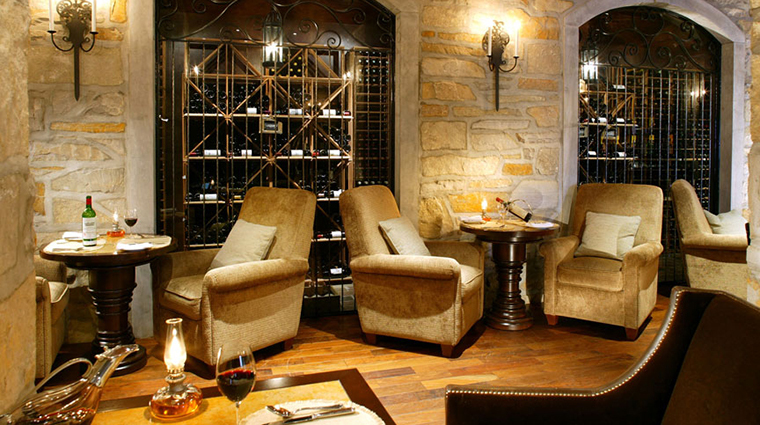 • If you’re feeling a little less formal, request seating by the fire in the Winebar next door to the main dining space — the menu is identical. 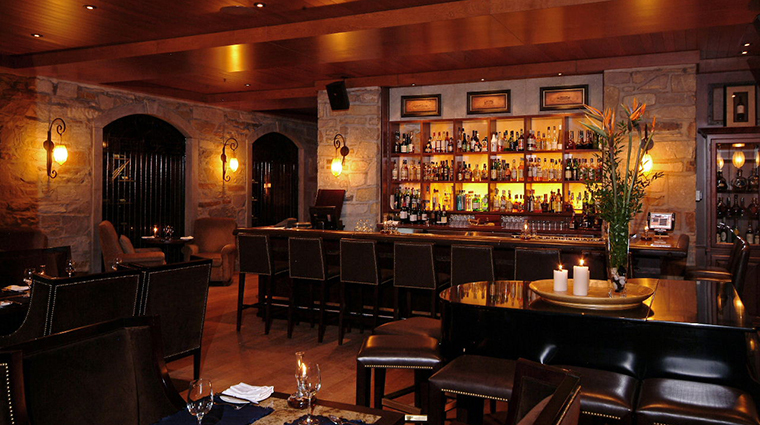 • There is no official dress code at Restaurant La Quintessence, but keep in mind this is one of Mont-Tremblant’s most sophisticated dining establishments. Upon entering, you’ll find collections of well-dressed folks gathered around the bar, sipping wine, discussing both business as well as their ski days. • Chef Georges Laurier, a Quebec native, incorporates both regional ingredients and inspiration from his travels into his take on Gallic cuisine. • The courses are packed with flavor, from the Vidalia onion soup with dark beer and local Wabassee cheese to the Nordic venison medallions with Labrador tea, spinach purée, onion and apple confit, and pepper sauce. • At dessert, go for the maple-soaked beignets. This is the Canadian Laurentians, after all, home of maple syrup. • The two-tiered restaurant is fronted by a full wall of windows and a terrace beyond that’s only steps from Lac Tremblant. • Soft upholstered seating allows you to sink into an intimate, relaxing experience. 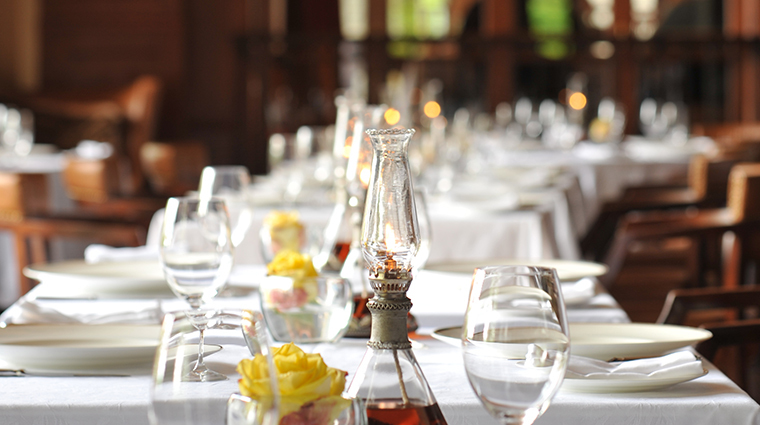 • At Restaurant La Quintessence, tables for two and four are candlelit and cozy. • Separate rooms with a view offer privacy for larger groups. There’s a secluded atrium overlooking the hotel’s gardens that can be reserved for a couple’s romantic rendezvous.